Barbecued suckling pig (大紅片皮乳豬) - we were short by a couple of people, so we only took half a pig. Nothing at all to complain about here... Yum. Deep fried frog legs with garlic and chili (椒鹽田雞腿) - there shouldn't have been much difference, but I thought these were slightly below the level of the ones at both Seventh Son and Fook Lam Moon (福臨門). Still decent, though. Deep-fried custard (雞子戈渣) - these had deeper flavors than the ones at Seventh Son. Braised garoupa fins with tofu skin (腐竹炆斑翅) - I always love the fins and the tails of a fish... and here they've been braised with garlic, tofu, and tofu skin. Long braised beef brisket and tendon in curry sauce in casserole (燜咖喱牛筋腩煲) - apparently my friend had curry beef brisket at Seventh Son very recently and was dying to compare the two versions. A strange choice as accompaniment to nice wines, but I understand my friend's current preference for food with heavier flavors. Well, as a matter of fact, I don't see this as "curry"... but more like the "Portuguese sauce (葡汁)" that one finds in Macanese cuisine. Well, whatever sauce they claim it was, it was pretty damn yummy. And of course the brisket and tendon were really tender. Love the red bean paste filling. Deep-fried sesame balls (燈影煎堆) - these golden, puffy globes are de rigeur here... I wouldn't dream of leaving without having a taste. 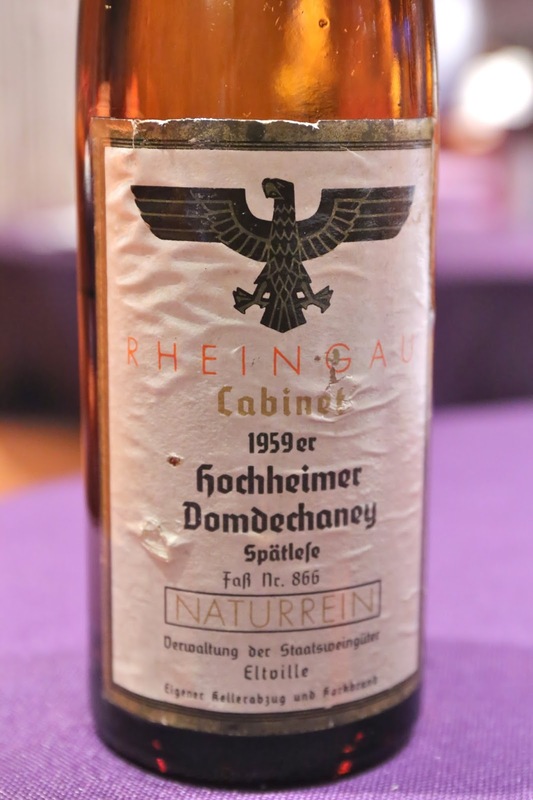 1959 Hessische Staatsweingüter Kloster Eberbach Hochheimer Domdechaney Riesling Spätlese Cabinet Naturrein - a little petrol, polyurethane, a little white flowers, and some orange blossom in the nose. Ripe but fairly dry on the palate. More soft and elegant after 55 years. 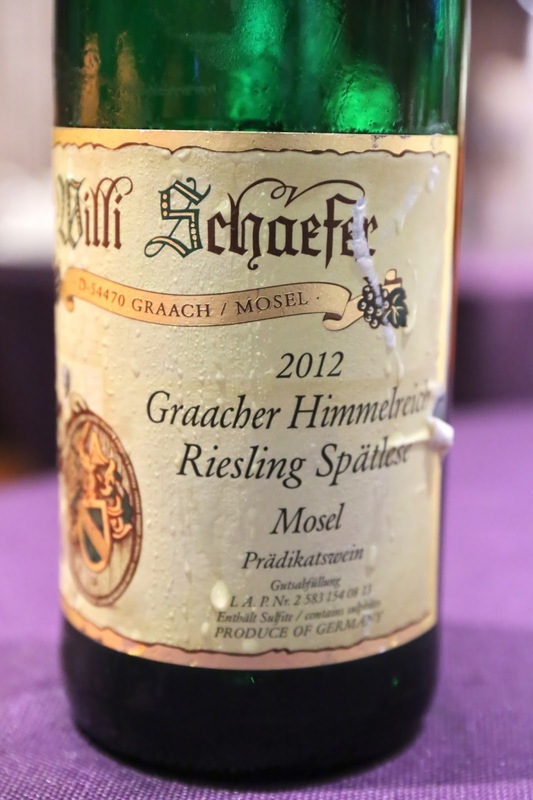 2012 Willi Schaefer Graacher Himmelreich Riesling Spätlese - much bigger nose here, with plastic, white pepper notes. Sweeter on the palate but also with nice acidity on the finish. More complex and bigger palate. Lovely. 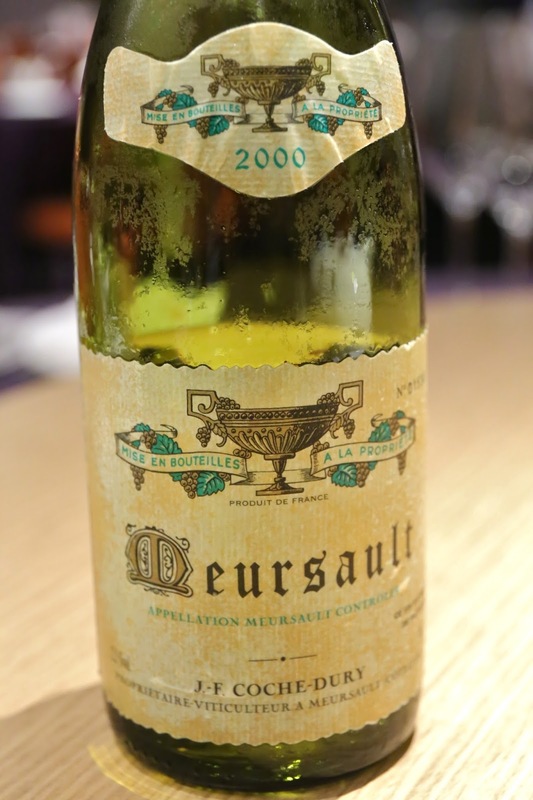 2000 Coche-Dury Meursault - nose was pretty muted and disappointing - with none of that classic huge toasty nose of a Coche-Dury. I've had a number of bottles from the same case, and this must have been just bottle variation. Nice on the palate, though, with a long finish, good ripeness as well as crisp acidity. It's my first visit in almost exactly a year, and once again the restaurant was almost completely empty - with the exception of 2 other tables in the main dining room and perhaps 2 private rooms. Last year I joked about "swatting flies (拍烏蠅)" here - in reference to the empty room... and tonight, there really were a bunch of (fruit?) flies buzzing around our food! But that wasn't the real problem. Thanks to the empty dining room - and Hong Kong's penchant for keeping air conditioning on at full blast - my sinuses got swollen tonight. My nose hasn't fully recovered from my recent sinusitis, and the one thing that is sure to trigger a reaction would be blasting aircon. Halfway through dinner I realized I could no longer smell very well, and as we were the only table in the main dining room, I asked the staff to turn down the aircon so that it wouldn't be so cold. I knew she had gone to do something, but it didn't make much difference. The aircon was still blasting, and I continued to be miserable.